New York: Congress of Industrial Organizations, n.d. but 1945. First Edition. Broadside flyer (25x18cm. ); printed offset in blue on cream stock. Minor uniform toning, else Fine. 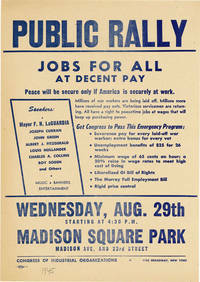 Flyer advertising a rally in Madison Square Park just days before the end of World War II in response to the "Millions of war workers... being laid off." Among the speakers listed are Mayor Fiorello H. La Guardia, with music, banners, and entertainment promised. Not separately catalogued in OCLC as of December, 2018. 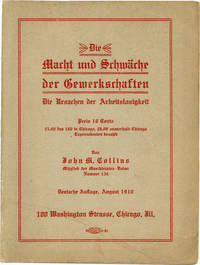 By [SOCIALISTS] COLLINS, John M.
Chicago: John M. Collins, 1910. First German Language Edition. Paperback. Short and uncommon study of trade unionism by a member of the Machinists Union no. 134 and a leading member and "agitator" of the Socialist Party. Neither the German or the English language edition of this title mentioned in Egbert. Duke only in OCLC as of November, 2018. 12mo (17cm. ); publisher's tan staplebound card wrappers printed in red; 32pp. ; photographic portrait frontispiece, full-page cartoons throughout. Light wear, faint dampstain to bottom edge of upper cover only just bleeding into textblock, else Very Good or better. Birmingham: 1898. First Edition. Possibly the earliest printed vestige of the United Mine Workers in Alabama. The UMWA has a rather complicated history in the deep south; the union suffered a powerful defeat, failing to win formal recognition among mine operators in its founding year (1890), and retreated from the region for most of the following decade. 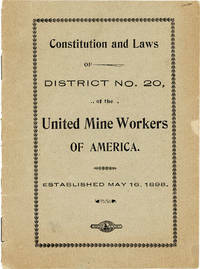 With the rising economic tide of 1897 the UMWA was able to re-establish itself; Alabama was established as the UMWA's District 20 in May of 1898 and Birmingham Local 423 was established a few months later. This Constitution, dated December 12-13, 1898, would thus appear to be the first of its kind in Alabama and one of the first in the deep south. Rare; OCLC gives no locations, nor do we locate any example of any Alabama-printed UMWA tracts preceding this one (the nearest competitor being the 1899 By-Laws of Birmingham Local 423, sold by us in 2017). 16mo (ca 14cm x 10cm). Staple-bound printed wrappers; 8pp. Mild external wear and soil; small losses to wrapper edges; Very Good. Signed in type at end of text by W.R. Fairley, President and I.L. Clemo, Secretary. n.d. but 1934. 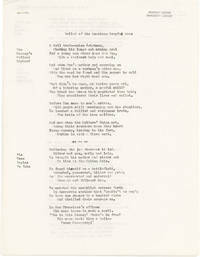 Lengthy unpublished ballad of 86 4- and 5-line stanzas recounting the plight of iron molder and IWW leader Tom Mooney from his birth to the present date (1934, based on the penultimate stanza on p. 6 describing Judge Griffin: "all these eighteen years [since the 1916 trial], / Has fought on Mooney's side"). Though no author is provided, the poet has a detailed knowledge of Mooney's biography and trial, beginning before his birth with his father, "A tall trade-union Irishman, / Choking his lungs out mining coal"; progressing to Mooney's early childhood helping his widowed mother make ends meet as a paperboy; and the first trial against him after dynamite was found (or planted) on a boat in the San Pablo Bay, a crime for which he was exonerated. The poem additionally recounts the first meetings between Mooney and Warren K. Billings, as well as the tireless travel and work his mother and sister shouldered to bring justice after it was revealed that the star witness, Frank Oxman, had perjured himself. The poem ends with the heartbreaking death of Mother Mooney, who was laid in state at the gates of San Quentin, and the mournful plea: "Warren Billings is forty years old. / Tom Mooney's hair grows white. / How soon will California turn / Her long, long wrong to right?" Another five years would pass before liberal Governor Culbert Olson would pardon him, in 1939. Original clean copy typescript poem; 9ll. on onionskin; previous mail folds, ex-Mooney Papers, Bancroft Library, with their small rubberstamps to each leaf, else Very Good and sound. Detroit / Troy: Literature Bureau of the Workers' International Industrial Union, 1919 - 1923. First Edition. Pamphlet. The WIIU, the labor union arm of the Socialist Labor Party, was effectively formed in 1908 following the split of the SLP faction from the Industrial Workers of the World; the group identified itself as the 'Detroit IWW' until 1915, at which point the name was changed to Workers International Industrial Union (a typically De Leonist mouthful!). The WIIU never throve; its membership probably never numbered above about 2500 workers, a number that dropped quickly following the death of Daniel De Leon in 1915. By the 1920s the WIIU was an afterthought, and the group was finally disbanded in 1925. Contents include articles by Michael Altschuler, Herman Richter, W.J. Dodge, Henry Kuhn and others; literary contributions by Samuel French, Fred H. Hartmann, Richard Le Galienne, William Morris, and Walt Whitman; portraits and reproductions of artworks by Eugene Higgins, Jan Styka, and Eugene Chaperon. An attractive and rather uncommon American labor souvenir book; OCLC notes 6 physical locations for any issue (2018); the 1923 issue, printed on clearly inferior paper (probably a reflection of the Union's impending demise), appears to be in the catalogue of only a single OCLC member institution (NYPL). Quarto (30cm). Staple-bound pictorial card wrappers; 40pp; illus. Issue for 1919 in clean, unmarked condition, Very Good or better. Issue for 1923 worn, with wrappers darkened and stained, contents slightly age-toned, with corner-creases and occasional thumb-soil; complete and just Good. 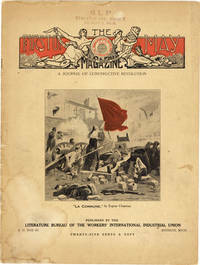 Annual souvenir of the Workers' International Industrial Union. 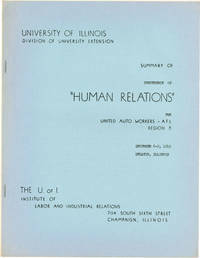 Champaign, IL: University of Illinois / Institute of Labor and Industrial Relations, 1949. First Edition. Paperback. Early-ish conference inspired by the Human Relations movement of the early 1930s. The event was co-organized by the UAW and the University's Institute of Labor with "emphasis...placed on some of the psychological factors involved in dealing with people. In a sense, therefore, it was a new and experimental approach to the problems of union representatives" (from the foreword--text by Ross Stagner, a professional psychologist). Latter portion of the conference devoted primarily to problem solving, role-playing, interviewing, and behavior. Two copies of this title located in OCLC as of December, 2018, at Cornell and U. Illinois. Quarto (27.5cm. ); publisher's blue mimeographed staplebound wrappers; ,14ll. printed from typescript on rectos only. Spine edge very slightly sunned, else Near Fine. San Francisco: San Francisco Labor Council, 1934. Ephemera. 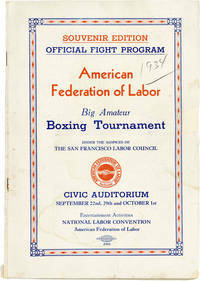 Official program for a three-day amateur boxing match held at the Oakland Civic Auditoriumin conjunction with the 1934 National Labor Convention of the A.F. of L. Fighters competed in ten weight divisions, from 106 pounds to Heavyweight; no boxers are pictured, but all registered entrants are listed alphabetically within their divisions. The event appears to have created something of a stir in the Bay Area, as contemporary newspaper coverage was brisk, especially for the second round of matches on September 29th, when an array of well-known fighters, including reigning heavyweight champion Max Baer, were in attendance ring-side. None of the amateurs participating appear to have gone on to any fame, but at least one achieved ignominy: the performance of one "King Kong" Lee, heavyweight finalist from Oakland,was singled out by the Oakland Tribune's boxing reporter as "...merely the worst of two very bad heavyweights...he seemed more satisfied with making grimaces and emitting a hair-raising jungle yell than settling down to actual fighting..." Such events were important aspects of American labor culture, helping to maintain morale and solidarity through the depths of the Depression and also helping to cement boxing's place as the proletarian sporting pasttime for a generation of spectators whose influence persisted into the Seventies and Eighties. Octavo (ca 9-1/2" x 6-1/2"); pp; illus; ads. Moderate external wear, with soiling and one brief loss to front wrapper at fore edge; internally complete, clean and unmarked; Good or better. Hoosick Falls, NY: Union Print Shop, 1920. Handprinted broadside (26x32cm.) on buff card stock; text in typographically decorative border. Stock uniformly toned, tiny dents at top corners, else Very Good or better. 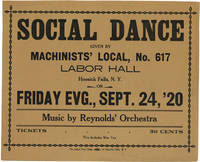 Placard announcing a dance at the local Labor Hall September 24, 1920. The ticket cost of 50 cents included "War Tax." At the time of publication Hoosick Falls was still the site of the farm machinery manufacturer A. Wood Mowing and Reaping Company, which in the 1890s was the largest of its kind in the world. By 1924, however, the company would cease to exist, unable to compete with John Deere's self-propelled farm equipment. Unlocated in OCLC as of August, 2018. Philadelphia: Knights of Labor, n.d. but before 1893. Scarce recruiting circular for the Knights of Labor, undated but presumably issued before Powderley lost the Master Workman election of 1893. Opening text differs from the earlier, 1885, circular, here describing the Knights as "not a political party, it is more, for in it are crystallized sentiments and measures for the benefit of the whole people." Recto provides the organizations twenty-two aims, including the abolition of child labor, the prohibition of "importation of foreign labor," and equal rights for men and women. Verso provides a description of the "Requirement of Knighthood," most especially that of exercising "the right of suffrage intelligently." Not separately catalogued in OCLC as of August, 2018. Broadsheet circular (29x15cm.). Signed in type by Terence W. Powderly, General Master Workman, at bottom of verso. Previous folds and rather substantial archival tape repair where stock has split at folds, faint contemporary ownership rubberstamp of J.A. Sorge to recto. About Very Good overall. Washington DC: District of Columbia Central Labor Union, 1900. First Edition. Hardcover. Octavo (23.5cm. 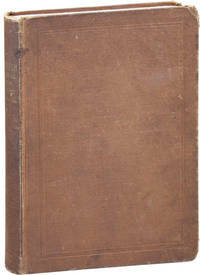 ); publisher's orange-brown blind-ruled cloth, gilt-lettered spine; 439pp. ; photographic illus. throughout, local illustrated ads printed on endpapers and scattered throughout text. Boards rather soiled and worn with some splitting of cloth at corners, spine darkened and gilt dulled, hinges cracked. A Good or better copy only of an uncommon Union history. OCLC locates 8 copies only as of August, 2018. [Drop Title] Workers, Let's Have What's Coming to Us! By [ORGANIZED LABOR & IWW] "BILL"
Seattle, 1920. First Edition. Paperback. Uncommon anti-union pamphlet recounting in a series of letters addressed to "Fellow Worker" the demise of a fictional Washington logging camp whose owner, inspired by the socialist writings of Bill Haywood, has given the camp over to the workers. In the end, due to lack of leadership, the introduction of the 40-hour work week, and paid sick leave, the camp has naturally gone bust. Yale only in OCLC as of August, 2018. 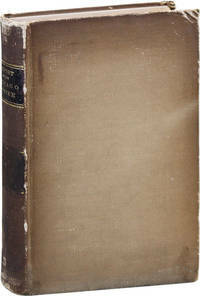 Octavo (20cm); pictorial staplebound self-wrappers; 7pp. ; illus. throughout. Wrappers uniformly toned and a bit brittle due to poor paper stock, else Very Good to Near Fine. New York: United Association Journeymen Plumbers and Steamfitters, 1939. First Edition. Detailed instructions with diagram of the ballot on which members of the UAJPS would be voting, using a rather confusing system of red levers ("If you make any mistake in the choice of your candidate, and as long as curtain [sic] remains closed, you can make any necessary changes by pushing wrong voting pointers back to original position." Because the levers were unmarked, the sample ballot would have been a required map for the voter. Truly a system to give the 2000 Florida election a run for its money. Large illustrated broadside flyer (27.5x43cm. ); printed offset in black on white stock. Previous folds and some soiling, else Very Good or better. Lemont, PA: F.M. Terrace, 1937. Broadside souvenir certificate (30.5x40.5cm.) on stiff card stock; a few small paper flaws along extremities, none approaching illustrations or text, verso rather toned, else Very Good or better. Includes collage American flags, the UMW's symbol, and a color portrait lozenge of President FDR, as well as various stencilled emblems and the phrases "In Union Is Power / Justice To All" in gilt. Manuscript calligraphy around FDR's portrait attributes this certificate to Local Union No. 1278 of Lemont, PA. Quite an attractive and well-preserved New Deal-era labor souvenir. Washington DC: Government Printing Office, 1895. First Edition. Hardcover. A massive and detailed report of the Pullman Strike, which began May 11, 1894, and ended unsuccessfully on July 20. Members of the Eugene V. Debs-led American Railway Union, at the time the largest labor union in the country, and workers at the Pullman Company, who had suffered wage cuts as a result of the 1893 recession, organized a Pullman boycott in which members of the ARU refused to drive trains with Pullman cars, leading to a nation-wide hault in freight and passenger traffic. The strike turned violent when 12,000 American troops arrived in the city, leading to 30 deaths and 57 injuries, all suffered by members of the strike. Debs and the Union would eventually be charged with the obstruction of the United States mail, a sentence from which the ARU never recovered. Thick octavo (22.5cm. ); publisher's tan cloth, spine stamped in black and gilt; liv,681pp. Boards rather rubbed along extremities, cloth quite darkened, especially at spine, spine lettering quite flaked, crease to pp. 62/3 with long clean splitting though leaf remains complete, small dampstain at bottom fore-edge corner of preliminaries. A Good or better copy overall, internally near fine. 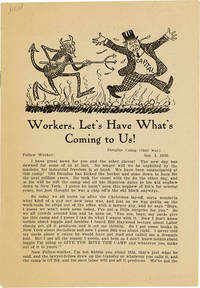 New York: Emergency Committee for Strikers' Relief / Committee to Aid the Defense of Ward Rodgers, n.d., ca. 1935. First Edition. Broadside flyer (25.5x15cm.) printed offset on white stock. Some uneven toning, old mail folds, tiny closed tear at top edge not approaching text, else Very Good and sound. Meeting at which Arkansas share croppers and members of the Southern Tenant Farmers Union E.B. McKinney and Walter Moskop spoke alongside Norman Thomas. Printed at bottom edge: "This is the only meeting open to the general public at which these Arkansas tenant farmers will speak." McKinney, a black share cropper, served as vice-president of the STFU, though later expelled for attempting to form a black union within the organization (see Donald H. Grubbs, Cry from the Cotton (1971), p. 176). Meeting co-sponsored by the Committee to Aid the Defense of Ward Rodgers, an Arkansas worker charged and imprisoned for "seditious utterances" (King City Chronicle (King City, MO), Feb. 1, 1935). This flyer not separately catalogued in OCLC as of August, 2018. New York: National Maritime Union of America / AFL-CIO, n.d. but 1961. First Edition. 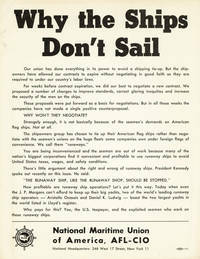 Informational flyer regarding the 1961 NMU strike after the ship owners refused to negotiate the union's contracts before they expired: "The shipowners group has chosen to tie up their American flag ships rather than negotiate with the seamen's unions on the huge fleets some companies own under foreign flags of convenience. We call them 'runaways.'" Among such runaway operators mentioned are Greek shipping magnate Aristotle Onassis. Date based on the mention of President Kennedy, as well as contemporary news accounts of the strike. This flyer not separately catalogued in OCLC as of December, 2018. Broadside flyer (27.5x21.5cm.) printed offset on white stock. Tiny closed tear to left-hand edge not approaching text, extremities a bit toned, else Very Good and sound. N.p.. Ephemera. A pair of exceptional original photographic portraits of John L. Lewis, first President of the Congress of Industrial Organizations, and Samuel Gompers, first President of the American Federation of Labor. Photographer and date are unspecified, so it is impossible to pinpoint these placards' provenance, but they were presumably intended for display either at an early AFL-CIO event or as a permanent decoration in an AFL-CIO union hall (a scan of public images of the early AFL-CIO conventions turns up no apparent matches). As the AFL-CIO merger took place in 1955, we tentatively assume a post-1955 date, though the style and typeface appear earlier and we can imagine any number of scenarios in which such placards might have been displayed together prior to the merger. 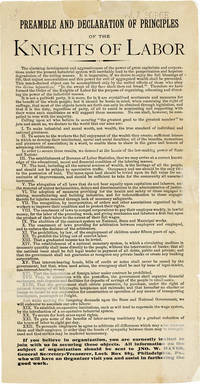 In any event, a unique example of labor-movement iconography, especially desirable given their extraordinary size and format. 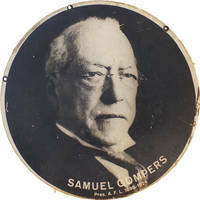 Two round ply-board placards, each 36" diameter with original photographic portraits mounted recto and verso, with printed captions in plate. Grommets at upper extremities for hanging. Images rubbed, with surface scratches and small losses, some surface soiling, still Very Good. An extraordinary survival. Reading, PA: Brotherhood of Railroad Trainmen, 1910. Initiation certificate to BRT member William Walter Spatz of the William Penn, 172, in Reading, PA. The head of the certificate shows an engine steaming past a grassy field (the engine only partly hand-colored red), over which is mounted Spatz's photographic portrait. Original lithograph certificate (57x35.5cm.) glued to mount (63.5x35.5), certificate printed in black on heavy cream stock, accomplished in calligraphic manuscript and hand-colored, with mounted original silver gelatin photographic portrait lozenge (7.5cm in diameter). Some light toning along extremities, verso (blank) suffering from frame burn, else Very Good and sound. Birmingham: Southern Afro-America Industrial Brotherhood, (1923). Ephemera. 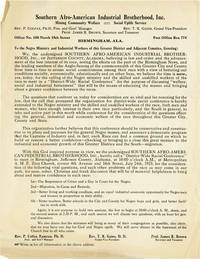 Circular, announcing a "District-Wide Racial Conference" for the purpose of "discussing welfare, social and industrial betterment that will be the means of educating the masses and bringing about a greater confidence between the races." Among the topics proposed for discussion are the suppression of crime, migration, living and working conditions, and education. The Southern Afro-American Industrial Brotherhood was a conservative, anti-union labor organization established in the early Twenties by Colfax Rameau, an A.M.E. minister and former coal miner. Rameau strongly opposed the UMWA and advocated cooperation between workers and industry as the only enlightened way to achieve both racial equality and better working conditions. Colfax appears to have enjoyed only moderate success as a labor organizer, but his efforts represented a very rare instance of organization from within the African-American community in the South. Circular. Single sheet, printed recto-only; 11" x 8-1/2" (ca 28cm x 22cm). Mild toning to paper; small corner-creases; Very Good. Pittsburgh: Steel Workers Organizing Committee, 1940. Hardcover. Six volumes bound in one; narrow octavos (23.25cm. ); contemporary green cloth lettered in gilt, original card wrappers bound in. Boards a bit shelf-worn, front hinge cracked between typescript table of contents and first wrapper, else Very Good or better, last three title with "Complimentary" rubberstamp to upper covers. Issued as S.W.O.C. publications no. 1-6. Contents as follows: 1. Handling Grievances. 24pp. Fifth Printing. 2. Production Problems. 28pp. 3. Murray, Philip. Technological Unemployment: "The Social and Economic Consequences of Technology." 56pp. 4. Industrial Training: Apprentice, Vocational and Industrial Training in Relation to the National Defense Program. 18pp. 5. Murray, Philip. How to Speed Up Steel Production: A Plan to Achieve Total Steel Output to Aid National Defense. 20pp. 6. Organized Labor and Management: How to Make Effective National Unity in Defense. 21pp.